Shine Music aims to combine innovative, fun and creative ways to teach music and engage with students to reach their full potential. Since Shine Music began in 2003, our professional approach and continual development has led us to becoming the leading provider of professional music education experiences in Australia. Teaching from our four Sydney music schools Parramatta, Chatswood, Burwood and George St Sydney, our reputation spans across Sydney through to Kalgoorlie Western Australia, Launceston Tasmania and Collinsville in Central Queensland. Music provides a unique platform for self expression, creativity and imagination. It can soothe the soul and empower individuals to reach their dreams. When it comes to teaching music however, motivating and encouraging students is a fine art in itself and requires lifelong dedication and development. Shine Music School has developed with a vision to provide an interactive and fun approach to teaching music and as a result, nurture the full potential of students. Understanding that existing music teachers and schools focused too narrowly on only one type of music, Shine Music School believes that music education should seek to teach and examine all types of music from contemporary to classical to world music to jazz, to keep lessons fun and tailored to help both young and old students. Discipline and practice is naturally engrained in a student once a student is serviced with the correct selection of music and teaching method that inspires them. Daniel and Jade performing at the Charity Concert. The teaching philosophy at Shine Music is based on the belief that the best musical development for students is attained through one to one music lessons conducted in a fun and supportive atmosphere. All the instructors at Shine Music School are hired because they have a great personality in addition to superior musical skills. The school is very selective in only engaging the best teachers who can connect with students of all ages and inspire them. This helps to ensure that all students not only learn the correct techniques to attain sustained improvement in their skills over time but to feel encouraged to embrace their interests and unique style of music. The instructors at Shine Music focus on creating an atmosphere of fun and excitement which helps motivate students to practice harder and master their instrument of choice. Since humble beginnings, Shine Music has been able to transform over 10000 students in Parramatta, Chatswood, Burwood, all over Sydney and all over Australia. Shine Music continues to cater to eager students with a range of lessons available including piano, violin, clarinet, cello, guitar, electric guitar, drums, flute, saxophone and voice. All instruments are eligible to sit for Australian Music Examination Board exams, Trinity Rock and Pop Exams and Associated Board Royal School of Music exams in classical, contemporary, rock and jazz genres. Shine Music School's experience and technical knowledge of many different types of syllabuses in preparing students for exams means excellent results are constantly awarded to our students. In an effort to share the joy of music and to allow students to express their passion with others, Shine Music hosts an annual Charity Concert every November to raise money for Australian charities including Sydney Children's Hospital. Not only has it helped raise funds for much needed causes, it has also provided a unique avenue for students to contribute to the community through their passion of music. This allows students to grow as performers and as individuals. 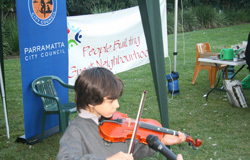 With Shine Music School's well known reputation in Sydney, students have been requested to perform at events like Lexus motors, Council Mayor Christmas parties, Monster Trucks, Carols by Candlelight and Australian Red Cross end of year luncheons. 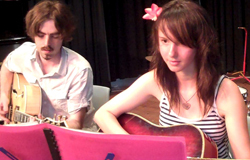 Today, Shine Music continues to work with students to improve music education in Australia.